For those who had the crazy idea to extract audits information from SharePoint 2007, you might have face the same problem I had. I’ll just redefine the context before getting to the solution. Note that beside the Delete type, the EventData object can have a lot of others information related to others types of events. I was working on a small console application to extract data from the SharePoint audit when I found two issues. When you are looping through your SPAuditEntryCollection, integrate this piece of great and advanced technology. and add / before the last occurrence of Recycle to end correctly the tag. 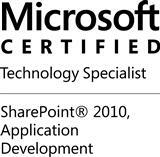 Note that the malformed Recycle element was fixed in SharePoint 2010 but you will still have the issue of the multiple root elements. A user should be able to upload a document and its metadata in SharePoint from a client based application, let’s take for this case Silverlight. For this matter, Sharepoint does not let us with a lot of options, indeed using anything out of the box would require two steps : upload the document, update the document to add metadata. FPRPC offers a nice way to do it in one operation. For more information about FPRPC, please refer to MSDN. The operation that we are interested in is defined in the FPRPC method put document. I won’t explain all the parameters of this method as everything can be found here on MSDN. All what we need to know is that it allows to write a file to a directory in an existing Web site and with the meta_info parameter, you can pass metadata into the method. The provided code is not to be used in production, it’s just meant to demonstrate a particular technical point. This is pretty straightforward, we build the metainfos variable which will contain the metadata linked to the document. We build the _method has it defined in the FPRPC documentation, then we execute BeginGetRequestStream. The AsyncCallback defines as it says the CallBack handler for the BeginGetRequestStream method. In this method, we create the datas variable which will holds the method to be posted and the file itself. we discovered another issue with the Office Search which is also related to the creation of a new SSP. We made a totally custom search page where we offer the user to refine the results using metadata, folder location and file types. but the following query runs successfuly on both configurations. Euh, yes … but what is the difference ? Well, the only difference between the queries is the number of OR statements. So it means that the query works with 4 OR conditions and not with 5, BUT when I put away the Where ContentType=’OurContentType’, it will work again with 5. Here is the solution I’ve come up with. 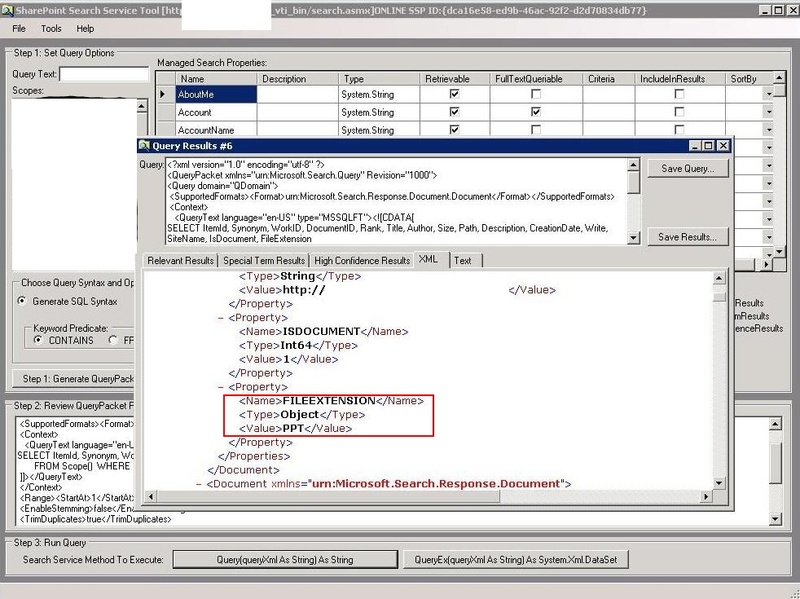 In the Search Administration, find the managed propoerty ContentType and check the allow to use in scope. You might need to execute a full crawl to have search results. That’s it, how could it be more weird? Some days ago, after having created a second SSP (Shared Service Provider) in our Sharepoint 2007 Farm, we started to witness a quite strange behavior. The object type of the built-in metada FileExtension had suddenly changed from String to Object. If you explore the DataTable returned by the query, you will see that the type is System.String. this will return System.String instead of the file extension. We have not found the root of the issue, so we implemented a dirty solution. If you have any additional information about this issue, feel free to post your answer. We have today created a second SSP in another farm and I can confirm that this is the root of the issue. We launched the search query before and after the SSP installation. Before the query, the FileExtension metadata type is correctly set to String. After the query, the FileExtension metadata type has suddenly changed to Object.